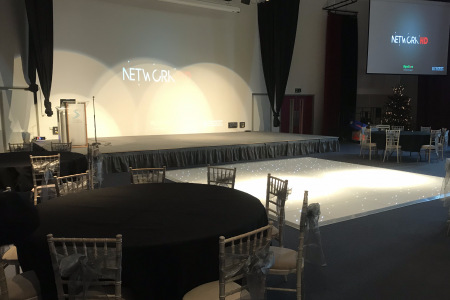 We were approached by Katie at the Strood Academy, a fantastic academy based in Rochester, back in July to assist with their Christmas party. The event was to take place in the academies main hall with the winter wonderland theme. During the planning process many ideas were sent over to Katie, with a range of chairs, dance floors and lighting suggested. A final decision for the Christmas party was made very swiftly, which made for a very straight forward planning process. 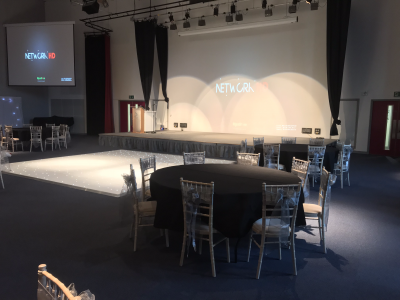 Our team arrived at the Academy early on the day of the event with the task of setting up the limewash chiavari chairs first. The chairs were set around each round table in groups of 8 with our dark silver organza sash tied around the back of each. The next task was to set up our starcloth backdrop before laying the 16ft x 16ft white LED dance floor infront of the hall’s stage. 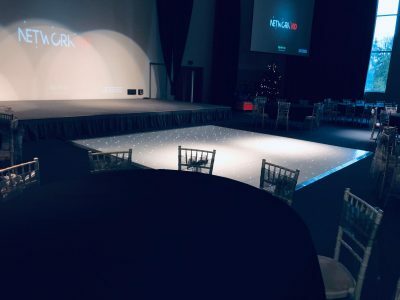 We received some fantastic feedback from the event and it was an absolute pleasure working with the team at the Strood Academy, from the first contact to when our team went back after the event to collect. Many thanks for providing a fantastic service for us on Friday 7th Dec – the event was a huge success! 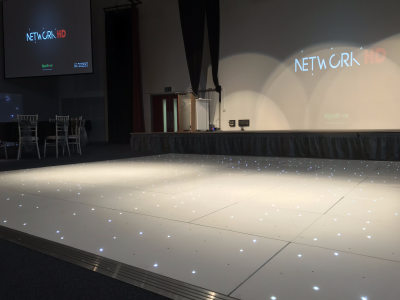 About to start an event like Strood Academy, Rochester | Christmas Party?